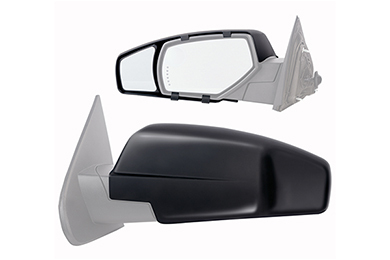 K-Source 80800 - K-Source Snap & Zap Clip-On Towing Mirrors - FREE SHIPPING! the item looks good, and quality is good, but they are very difficult to snap on. The bottom snaps are very difficult to engage. Fit well, minimum vibration, and look better than any other add on mirror I have seen. Blends great with stock mirrors. These snap on mirror extensions work just as advertised. Just what I needed for my 29 ft 5th wheel. I did have to remove the cushion tape because I have the chrome mirrors, but the instructions were accurate. Reference # 763-251-673 © 2000-2019 AutoAnything, Inc.